While, I had seen the adorable Tentacle Kitty before, I was really only introduced and learned quite a lot about her at this year's Toy Fair. I saw a pretty booth girl walk around with the plush toy and was curious to learn more about the product. I managed to do just that when I visited the very cool, little booth that was toy line's home at the fair. The title character and her friends are from another dimension where cats have tentacles. Aside from these cute toys, they have their own webcomic and already have a strong cult following. President and creator John Merritt was telling me how their line was so long at New York Comic Con, that security had to end it everyday, as fans just kept lining up! Most of the product shown here is out already. 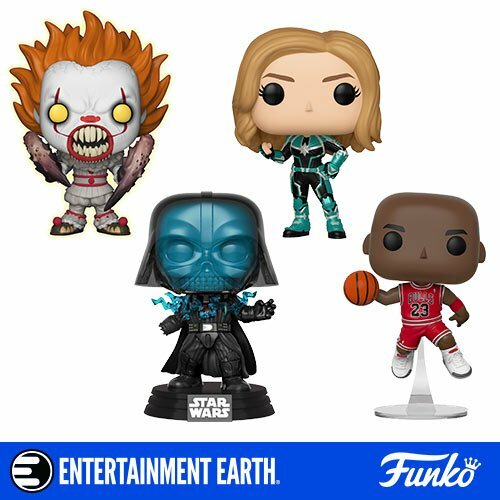 I was also told that they recently worked out a deal with Entertainment Earth about doing some exclusives with them in the future! Directly above is NinjaKitty and Pirate Kitty! Every series needs villains and here is this one's. Seen to the right, they are the Rat Tailed Unicorns! So, basically here are all your happy geek needs in one place: kitties, tentacles, unicorns (bad ones, no less! ), pirates, and ninjas, all with an anime inspiration. What is there not to love?